I had the pleasure of interviewing fashion designer, chef and UK “I’m A Celebrity Get Me Out of Here” runner up (yep) David Emanuel. This is the man who designed Princess Diana’s wedding dress in 1981, with his then wife, and has had more than an illustrious career since. 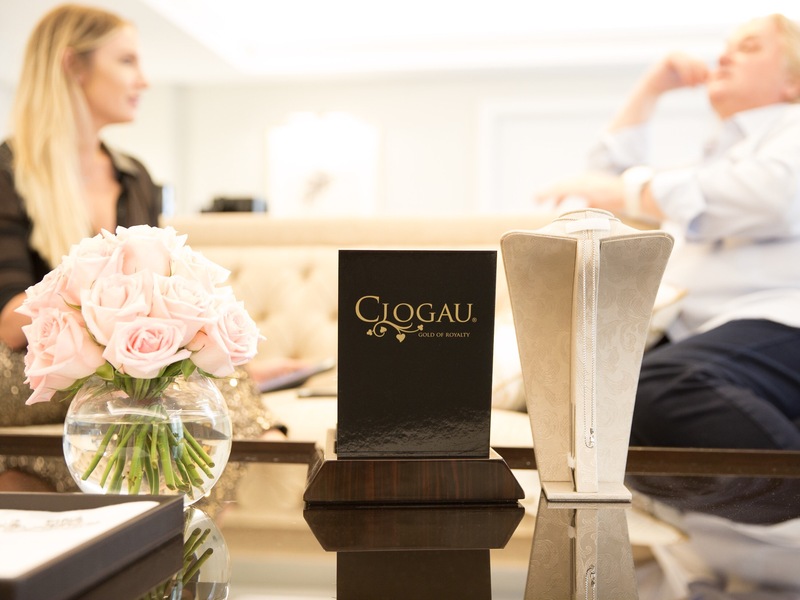 He is in Australia to launch his new collaboration with Welsh gold company and supplier of gold to the Royal family – Clogau. Jill: You just arrived in Australia- is this your first time here? David: We arrived in Australia a few days ago. It’s not my first time here, last time I was on the Gold Coast for a show called ‘I’m A Celebrity, Get Me Out of Here,’ I was in the jungle! Jill: Did you enjoy it? David: Oh, good heavens no! Jill: Did they make you eat something disgusting? Jill: You are on our shores for the launch of your latest collaboration with Clogau. What was your inspiration behind your latest collection? David: I knew of Clogau. The similarities are amazing. They too have a close relationship with the palaces. And it all sort of worked. As a designer, it’s always an honour to be asked. I looked at Clogau and it’s very intricate. I wanted to put a contemporary spin on it – keep it very clean, simple but use the gold and then tie it with Swarovski crystals. Keep it very easy to wear. And I came up with two symbols, the heart obviously for romance and dreaming of stars – so it’s either of the two symbols. Jill: What is the price point for the range? Jill: How did you select the materials for this collection? David: I was trying to add sparkle, and I wanted some bling and obviously Swarovski came up. And I remember a million years ago, I used to buy materials from France and I used to get my silk merchants to send the organza or taffeta to Swarovski, and they used to polkadot it all over. And then I would make ball gowns out of it. *We got to talking about my wedding and wedding dress, listen to the full interview below to hear about David’s thought on my dress and what I could potentially do with it. Jill: In such a transient industry such as fashion, how have you managed to stay so current for such a long career? David: I can’t answer that. I see everything as a challenge. This obviously grabbed me from the start – it’s an obvious one. I’ve been very lucky. In the early days I jumped off the Ready to Wear treadmill very quickly. I used to do small collections and sell them to London boutiques. My first couture client was Bianca Jagger, then it was Carolina Herrera, then the Royals and so, I think if you are on this Ready to Wear treadmill, its relentless. And I got off and I really enjoy meeting people and the private client side. Because every dress is different. And then of course, there is the press…. Jill: In this current climate we are seeing almost a disposable fashion trend coming through, have you experienced any shift in demand for high end designs? David: I think people are very conscious of couture now. I’ve never analysed my couture business but sometimes it’s busy and sometimes it’s quiet. I have one client that wont allow a label in her jacket. People are very aware of ‘over wealth’, but you know and I know, there are chic women around the world who live on a different plane. They may take their jet to the shows and maybe drop in and get a few pieces from me. This disposable fashion is hideous. It’s cheap, cheap, cheap and cheaper. And people are buying more and more and throwing it out – so we have mass of clothes. And its the opposite of French women who have always loved quality. They will buy one or two pieces a season and add to their navy wardrobe, or what ever their wardrobe is. People are now expecting cheaper across the board, it’s like a disease. Jill: I understand you are a man of many talents, designer, musician, singer, presenter… and I’ve heard a great cook – What’s the next challenge for you? David: One can rustle up – yes! I see it as a taste thing. If you are going to do something, you need to do it well. Cooking takes time, you see. But on the rare occasion that you have that time, you want to make something wonderful… I really don’t know what’s next – I didn’t think 36 yrs after Diana, I would be sitting in Australia talking about her. She (Diana) was the best ambassador for British fashion EVER! Right the way through she endorsed British fashion around the world. She put us back on the map. Jill: And finally I have to ask a Trump question – I understand you have previously dressed Ivana Trump. What style direction was the brief for this? David: You have to remember she was given the plaza hotel by ‘The Donald’ to redesign and she did a bloody good job. Completely changed the whole hotel, made it fabulous. Made it warm. Made it very chic. She’s a powerhouse as a woman. I did lots of clothes for her. She would come over for the summer, so lots of day suits. She did the circuit and of course she entertains a lot. A huge thank you to Polkadot PR for inviting me along and facilitating one of the most fascinating interviews I have done so far. What a great interview! I really enjoy it Jill.